Uzbekistan is famed for housing an incredible number of scenic mausoleums and mosques in every shade of blue. 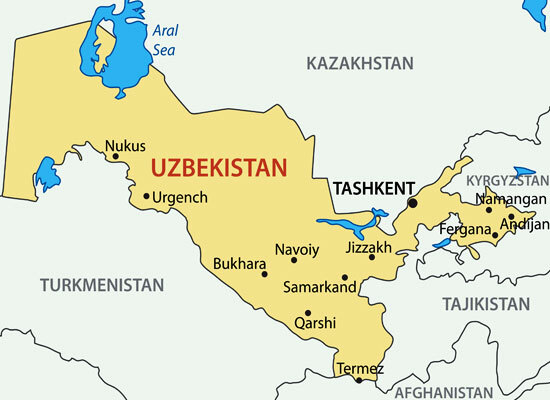 Uzbekistan – The pearl of central Asia tour lets you explore this fascinating country to your heart’s content. The meticulously-crafted itinerary offers numerous opportunities to visit the country’s popular attractions. During the 4 days tour, you will soak in the beauty of the mountains, National Parks, lakes and so much more. From Chimgan to Samarkand, you will be delighting in various moments to be cherished forever. Upon arrival at the Tashkent Airport, complete the customs formalities. Thereafter, receive a warm welcome from our tour representative who will help you with guided transfer to one of our pre-decided hotel. Post reaching, complete the check-in formalities and savor a scrumptious lunch. This is followed by a brief introduction about the tour. Rest of the evening is to be spent leisurely. A gala dinner is arranged for you in a prominent restaurant. Start your day with a hearty breakfast at 9000hrs. Subsequently, enjoy a road trip to the Chimgan Mountains. 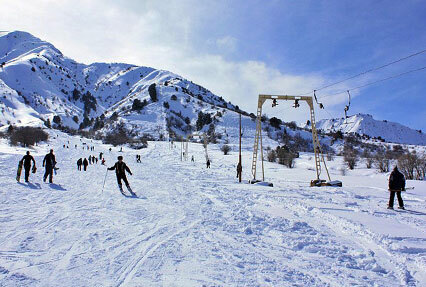 The valley of Chigman is overlooked by the Great Chimgan Mountains and is famed as the Skiing resort of Uzbekistan. A number of beauty spots enhance the charm of the mountains. A Chair Lift will carry you to the highest point and during the ride, you can enjoy views of the mountain and lifestyle of the aboriginals. Don’t forget to click amazing pictures. The Ugam-Chotqol National Park is well-known for snowboarding and skiing as it remains covered with snow from October to May. 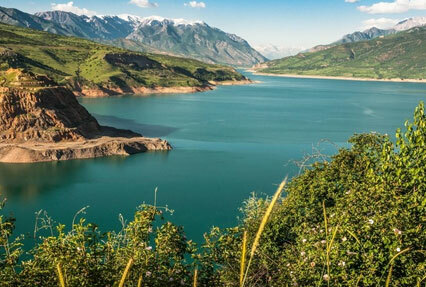 Post this you will be transferred to the Charvak Lake where you can admire its beauty. Blue waters of this picturesque lake grabs the attention on the very first sight itself. The lake is formed by joining of four rivers. Satiate your hunger with delectable lunch. Spend rest of the day leisurely at the lake. Return to Tashkent in the evening. Relish a delicious dinner at a restaurant. Day 3 of Uzbekistan – The Pearl of the Central Asia tour begins with the appetizing breakfast. Post this get ready for Tashkent sightseeing tour including a visit to the Romanov Palace which is one of the unusual monuments of Tashkent. The elegantly designed edifice was adorned with distinctive windows, carved grids and other decorative items. Learn about the history of Uzbekistan at the Museum of Victims of Political Repression in Tashkent. Gaze at the Tashkent TV Tower which is 375-meter high. Another highlight of the day trip is the Monument of Courage which is dedicated to the 1966 earthquake in Tashkent. Get a glimpse of the Opera and Ballet Theatre which is named after Alisher Navoi. It is one of the largest and unique theatres in Central and Southeast Asia. The sightseeing tour to Tashkent resumes after the lunch with the Kukeldash Madrasah. Built-in around 1570, the Madrasah consists of a big portal and an inner yard. Head towards the Hast Imam Square which is the religious center of Tashkent. Pay homage at the Sacred Heart Cathedral. The trip ends with a visit to the Russian Orthodox Church. After having your dinner, return to the hotel for an overnight stay. Relish a tempting breakfast. Subsequently, get ready for shopping. 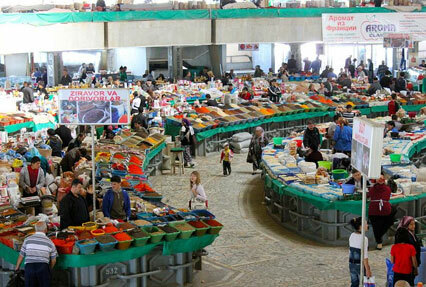 The local markets in Tashkent are ideal places for buying souvenirs. Chorsu is one of the oldest markets where you can shop till you drop. While on your shopping tour, you can get to see the Old City where the Uzbek people used to live separately from the Russians. Continue shopping at Mega Planet Mall after having lunch at a restaurant. At 1700 hr. 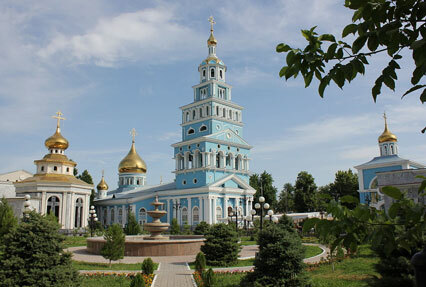 you will be transferred to the Tashkent airport to catch your flight towards your onward destination.